LdapAdmin templates extend the application functionality in a seamless way. They provide additional help when editing objects with existing builtin tools such as generic editor or property dialogs, but can also function as standalone property objects. This behavior can be controlled by using general option dialog. The builtin general editor is now extended with the template functionality to assist with editing of objects which are not directly supported by LdapAdmin. If this option is activated and existing LDAP entry is opened for editing, LdapAdmin will try to determine which templates match this entry and load them automatically. Depending on the object complexity and number of templates, turning this option on may result in slight delays when opening entries. In this case you may turn it off; it won't affect further template functionality in any way. The checkboxes on the right side represent a template option which can be turned on or off, in the same way standard dialog options do. This is probably the most interesting and powerful template option. LdapAdmin supports a number of objects which can be created and modified by using the property dialogs. When turned on, this option will allow you to use templates as additional property objects. New menu options will be added allowing you to choose from the templates when creating new objects. Furthermore, choosing the option Properties... on the selected object from the main or popup menu will search for the matching templates and display all matching templates in a property dialog allowing you to modify the object as you would normally do with any other object directly supported by LdapAdmin. Defines template name as it occurs in the template list. This directive is required. Additional descriptive information of the template. Optional. Represents designated RDN (relative distinguished name). This argument has effect only when new entry is created using the template. It represents attribute name which will be used to automatically form entry's DN as soon as designated attribute receives the value. For example, if designated RDN has a value of cn then, as soon as cn value is determined the RDN of new entry takes the value of cn=<value> thus automatically giving a value to the DN of the entry. Optional. This directive defines a dialog name which can be extended with this template. If the general options allow it, the template will be embedded in the existing dialog. Currently, user and group dialog support extending. This argument is optional. You can define icon for this template to be displayed in menus and toolbars. It must be a windows bitmap file and should have a dimensions of 16x16, if it doesn't it will be automatically resized to fit this size. You can either define path to a file containing bitmap data using <file> tag or include base64 coded bitmap directly within <bitmap> tag. Bitmap tag is preffered over file tag so if both tags are defined the bitmap tag will be used. To define transparent color use <transparentcolor> tag. You can use decimal or hexadecimal notation. Hexadecimal notation must be prefixed with a $ sign, e.g. $FF00FF00. Attributes are one of two basic building blocks of LdapAdmin templates (the other are controls which are explained next). Attributes are elements which are used do describe data. One template attribute defines data belonging to corresponding LDAP attribute identified by its attribute name. In LdapAdmin templates controls are attached to data, therefore one attribute can contain one or more controls which manipulate its data but it can never contain another attibute. In other words, you can define controls within attribute body but it is illegal to define attribute within body of another attribute. If you do not define any controls within attribute body, default control will be automatically created for the attribute if attribute type was defined. You should always define attribute type unless you intentionally want attribute to be hidden, i.e. not to have a visible control attached to it. You would generaly do so with objectclasses or some other attributes which are directly mapped to another attribute by the means of parameters and should not be changed by user (such as when cn maps to uid litteraly). Whereas attributes define data, controls define elements used to manipulate this data. To attach control to data, simply define it within the attribute body. During runtime, the control is displayed and changes are reflected in the values of attribute the control was attached to. However, you can also define controls outside the attribute. Such controls are not attached to any data and manipulating them would have no effect on LDAP directory. So why should we define controls which do not affect data? Well, you can define controls such as panels, groups and simmilar to place other controls on them and optimize your template layout. While it is illegal for an attribute to include other attributes within its body, for controls it is not. A control can contain other controls or attributes, thus making it possible to create complex layouts with nested controls. There is virtualy no limit (well, there is but you'll never hit that) to number of such nested controls. Defines attribute name as it occurs in LDAP. This directive is required. then, as soon as the values for the attributes firstName and sn are known the LdapAdmin would take those values to form the new default value for the attribute uid. As long as all parameters don't have value, the whole default value is left empty. If you need to have % sign in the text use escape character ('\') to indicate this. Name of the control. This directive is optional, only used in conjunction with chained controls (controls which act on other controls, such as pickupdlg). Specifies the background color of the control. A hexadecimal RGB value, i.e. 0xff0000 for red. Specifies the color of the text characters. Specifies the font style. A comma separated list representing a combination of one or more of the following styles: bold, italic, underline or strikeout. Specifies the height of the control in pixel. Can be true or false. If false then the control will be grayed out and user interaction will not be allowed. Regular expression used to validate the content of the control. The tag option type determines the control type which will be used. Depending on the control type additional options may be defined. This places a standard button on the form which can be used with scripting engine. Standard single line field used for displaying and modifying text contents. Use tag <editmask> to define format of the text field. Displays a line of text. The control can display a content of an attribute or a fixed text which can be defined with a <text> tag. Dropdown list field used to choose items from the list returned by LDAP search. Required directives <filter> and <base> are used to define LDAP filter and search base for the query. Tag <displayattribute> defines which attribute value will be used as a caption for the items. Tag <valueattribute> represents the result attribute; value of this attribute will be passed to the attribute the combo control belongs to. Both directives are optional and default to dn. For a description of the filter directive, see pickupdlg control. Three state checkbox control. Use tags <true> and <false> to define values for checked and unchecked state, all other values will be represented with grayed checkbox meaning undefiend state. If you do not define your own values, the default strings "TRUE" and "FALSE" as defined by OID 1.3.6.1.4.1.1466.115.121.1.7 will be used. Valiadated text box for entering decimal values. Valiadated text box for entering integer values. String grid used to edit multiple text values, mail addresses for example. Use tag <rows> to set number of grid rows. Used to display jpeg images. Currently read only. 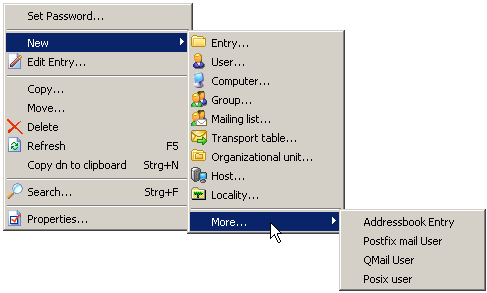 List control used to display multiple text values, mail addresses for example. Mostly, you will use a listbox control which provides a means of manipulating the data as well. A list control with buttons to allow adding, editing and removing of the list entries. The controls are grouped on a panel control. You can use bevel tag to control the panel appearence. The margin tag represents the number of pixels between the panel border (which in turn can be switched off through the bevel tag) and the controls (list and buttons) within. The buttons tag defines a group of control buttons used to manipulate the list content. Can be used to set password on arbitrary attributes. Bordered area used for layout otimizing that displays multiple tabs which can host further controls and attributes. d Day of month as digits with no leading zero for single-digit days. dd Day of month as digits with leading zero for single-digit days. ddd Day of week as a three-letter abbreviation. dddd Day of week as its full name. M Month as digits with no leading zero for single-digit months. MM Month as digits with leading zero for single-digit months. MMM Month as a three-letter abbreviation. MMMM Month as its full name. y Year as last two digits, but with no leading zero for years less than 10.
yy Year as last two digits, but with leading zero for years less than 10.
yyyy Year represented by full four or five digits, depending on the calendar used. gg Period/era string. This element is ignored if the date to be formatted does not have an associated era or period string. gtz LDAP Generalized Time format as defined by 1.3.6.1.4.1.1466.115.121.1.24. The control will only change date portion of the value field. unix Datetime in unix format. The control will only change date portion of the value. Time control with support for different time formats. The formats for display and actual values can be separately definedby using <timeformat>, <dateformat> and <displayformat> tags. Analogue with date control, this control will only change the time portion of data allowing it to be combined with date control on the same LDAP value. h Hours with no leading zero for single-digit hours; 12-hour clock. hh Hours with leading zero for single-digit hours; 12-hour clock. H Hours with no leading zero for single-digit hours; 24-hour clock. HH Hours with leading zero for single-digit hours; 24-hour clock. m Minutes with no leading zero for single-digit minutes. mm Minutes with leading zero for single-digit minutes. s Seconds with no leading zero for single-digit seconds. ss Seconds with leading zero for single-digit seconds. t One character time marker string, such as A or P.
tt Multicharacter time marker string, such as AM or PM. gtz LDAP Generalized Time format as defined by 1.3.6.1.4.1.1466.115.121.1.24. The control will only change time portion of the value. unix Datetime in unix format. The control will only change time portion of the value. This control is actually a combination of date and time controls visually grouped and syncronized to act as a single control. The actual date and time controls can be displayed in vertical or horizontal alignment. This can be controlled with the <align> tag. The panel appearence can be controlled with the <bevel> tag (see panel control for parameters). 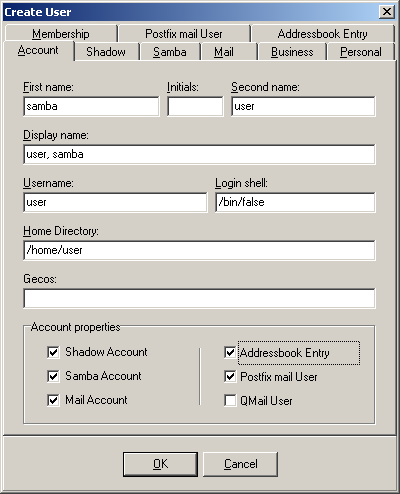 Powerfull multichoice dialog used to choose entries from the set obtained by LDAP query.